Carpenter Bees, also known as bore bees or wood boring bees, earn their name due to their ability to excavate tunnels into wood. Sometimes mistaken for bumblebees, carpenter bees have a shiny, black abdomen and can often be observed hovering near the wooden eaves of houses and porch railings during the summer months. Although they are generally harmless (males cannot sting and females are tough to provoke), the extensive and repeated tunneling of carpenter bees can cause structural damage. A wasp and hornet spray will kill carpenter bees. A long-term solution, however, is more effective. Watch where the bees are most active during the height of the day. Locate the tunnels that are being used by the bees. If you don't see any bees hovering about, look for signs of activity, such as the light sprinkling of sawdust from the opening of a tunnel or excrement along the side of the building. Apply the insecticide dust directly into the tunnel. Simply spraying around the tunnel will not work. The dust must be inside the tunnel for the bees to distribute it throughout the network. Wait until after the sun has gone down to begin your dusting. 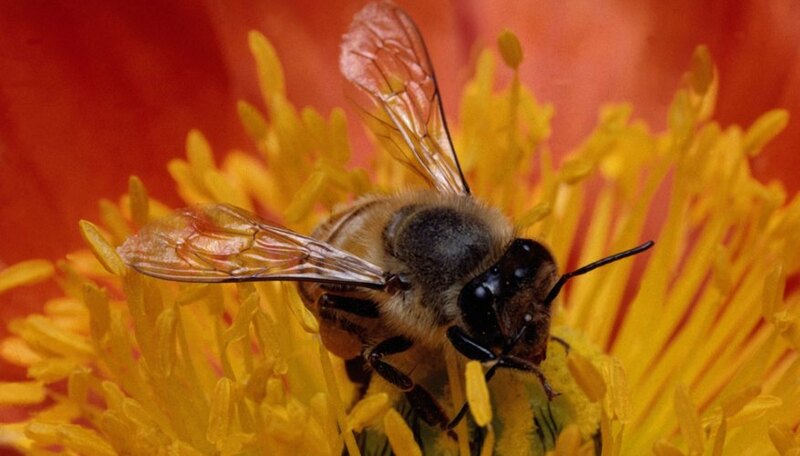 Wait at least 24 to 36 hours to allow the bees to distribute the poison through the tunnels. Use the aluminum foil to make small plugs for the tunnels. After the appropriate amount of time has passed, plug the holes. You can also use wood caulk to fill the tunnels if you so desire. Use wood putty and an applicator to cover the plugged tunnel. Attempt to make the surface as even and smooth as possible. Paint the wood with the color of your choice. Make sure that it is an outdoor, oil-based paint. This will help deter future wood boring bees from taking up residence on your property. Carpenter bees will usually not attempt to excavate tunnels in painted wood. It is best to treat for carpenter bees during the spring, before the bees reach the height of their activity. Treat again in mid-summer to kill any bees that escaped your first treatment. Finally, apply insecticide and plug tunnels in the fall to kill any bees that using the tunnels over the winter. Wear the proper protective gear when applying insecticides. Stand upwind from the dust and wash your hands and clothing when you're done.